@Connor S: Yes. That was the guy that gave green lantern the ring. He’d wear the ring on his right hand, so you wouldn’t really see it in this orientation. I always thought the huge glowing or radiant effect in most GL drawings regarding the ring were too showy, so I wanted something more subtle here. The left leg and knee and foot were deliberately twisted about to make it all more action-oriented and dynamic, maybe it went too far. I dunno, I kind of like it. 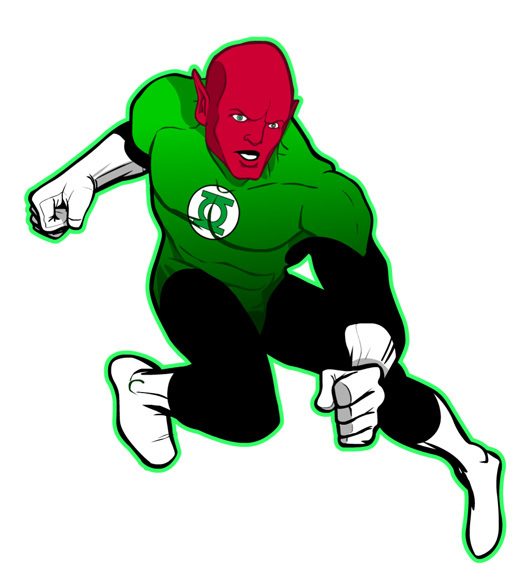 And yes, Abin Sur was the original Green Lantern of our sector who crashed on Earth. As he lay dying he sent the ring to find a worthy human without fear to take his place. The ring brought back Hal Jordan and the rest is history. Well, history rewritten several times, then turned inside out, brought back, killed, resurrected, and rehashed. Hey Jeff, I have a completely unrelated question, but could think of no where else to ask it (I don’t know where I could find alternate contact info, is that somewhere on the site?). This seemed good enough, sorry if it’s annoyingly out of place. Here’s my question: A while back, probably a few months ago, you posted an image file i think that was simply a list of all the possible “classes” or “types” that could be in a superhero team. I thought I saved it, but cannot find it on my computer, so I looked around the blog but without a good idea of when it was posted or under what category, I can’t find it. Do you know what I’m talking about and can you direct me yo that post? Shouldn’t his skin color be a darker shade?